I return today to the vexed question of whether St Ermentrude of Sigmaringen should be included in the Kalendar of the Ordinariate use. Ermentrude subsequently reached England, where she took refuge in the convent of St Frideswide in Oxford. There she not only worshipped from time to time at St Thomas’s church in that city, but (music being one of her many talents) she perfected a variation of the Tonus Peregrinus which later received the unqualified approbation of Dr H D ‘Patrimony’ Palmer. ** John of Malmsbury (Early English Text Society, Misc 437) tells us that Ermentrude’s version was in use a century and a half later, at the Priory of Osney. 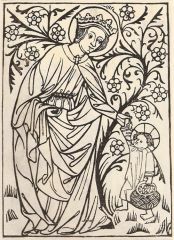 Ermentrude’s feast was unique in the Catholic Church in being originally celebrated on the date of her escape from incarceration. It was extended to the universal calendar by special favour of Boniface VIII, a celebrated connoisseur of plainsong. Alas, in the revisions of the malevolent Annabile Bugnini ( you knew he would get into the story somewhere! ), this hapless maid sank without trace. *I am grateful to my friend Professor Tighe for this invaluable information.